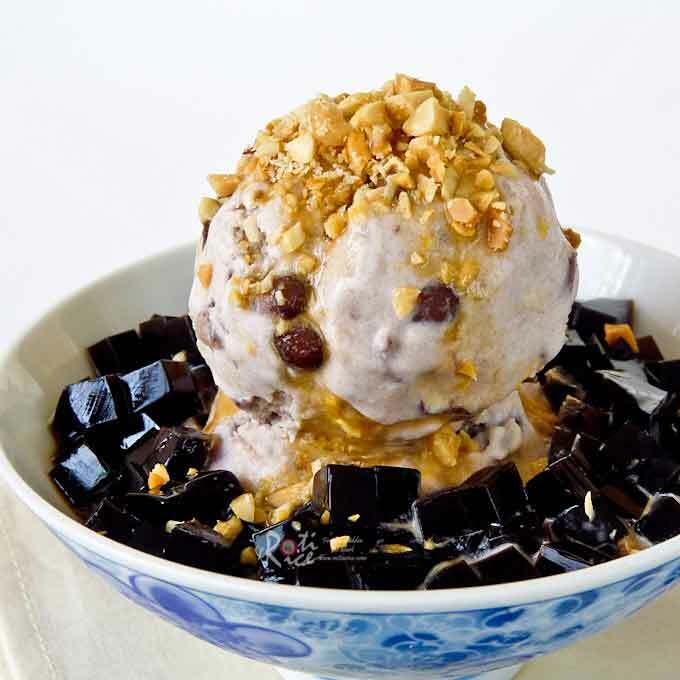 Red Bean Ice Cream with Cream Corn topped with chopped peanuts, grass jelly, and palm sugar syrup to resemble Ais Kacang, a popular Malaysian dessert. Ice cream is slowly making a comeback as I see it popping up here and there in the blogosphere. Ro-Ri San bought me an ice cream maker last fall which has been sitting on the shelf until I made Coconut Banana Ice Cream in February. I was pleasantly surprised at how easy it was to make ice cream with the ice cream maker. Best of all, it was so delicious and I could add whatever ingredients took my fancy. Growing up in Malaysia, we had some tropical flavors that are not easily found here. They are red bean, sweet corn, taro, and even durian…yes durian! Known as the king of fruits in Southeast Asia, those who love durians (and many do) use them in their cooking, from curries to dessert. No, I did not add durian to this ice cream or I will end up eating it all by myself. I did however base this Red Bean Ice Cream with Cream Corn on a favorite Malaysian dessert known as Ais Kacang which is shaved ice topped with red beans, cream corn, agar-agar, grass jelly, and chopped peanuts, drizzled with coconut milk and palm sugar syrup or red syrup. 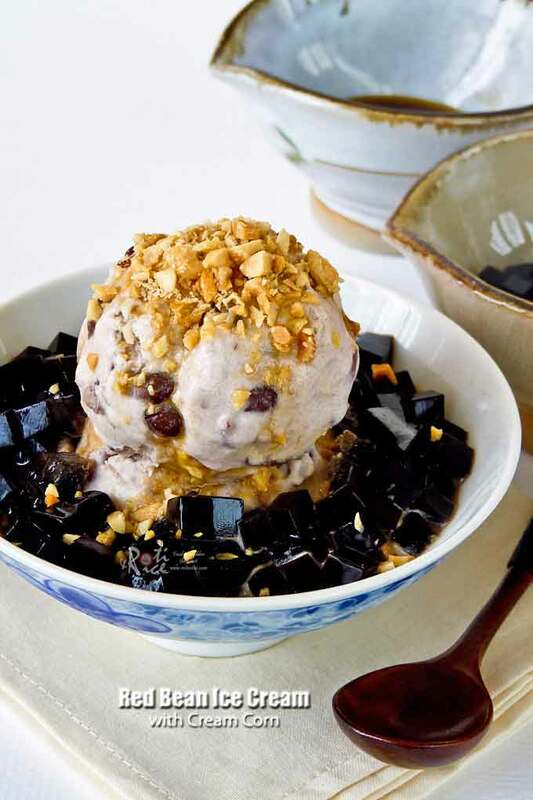 This is a very popular dessert in the warm and humid climate there. To make this dessert, you need an ice shaver. I do have a little one tucked away somewhere but instead of digging it out, I decided that I should try making it into an ice cream with my new toy. The family enjoyed it so much that I have already made this twice and will be making it throughout the summer months. Freeze ice cream bowl for 24 hours. Soak red beans overnight. Rinse and discard soaking water. Combine red beans, sugar, pandan leaves, and water in a medium size pot. Simmer on low for about 1 to 1½ hours or until beans are soft and most of the water has been absorbed. If water boils down too quickly and beans are not soft yet, add a little more water and continue boiling. Remove pandan leaves. Add coconut milk and let it come to a boil. Turn off the stove. Stir in in cream. Cover and chill overnight. Remove ice cream mixture from the refrigerator. Add cream style corn and stir to combine. Place frozen bowl on base of ice cream maker and turn it on. 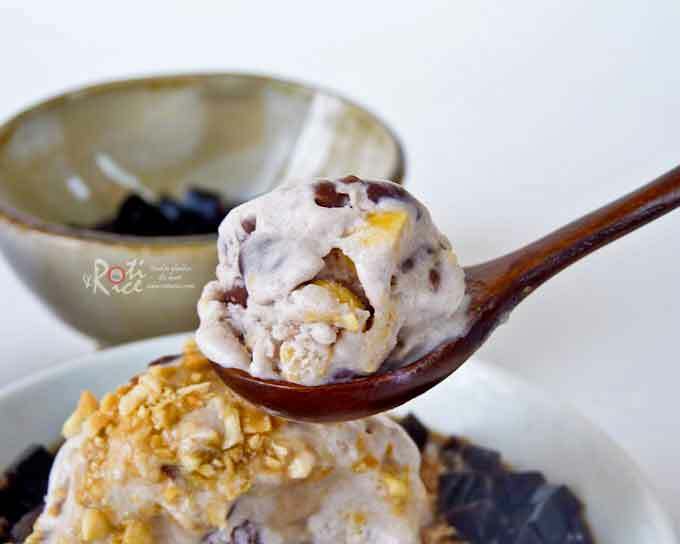 Pour ice cream mixture into frozen bowl and churn until desired consistency, about 15 to 20 minutes. If you prefer a firmer consistency, transfer ice cream to a container and place in freezer for a couple of hours. Wow.Ais Kacang Sundae looks so tempting. Grass jelly can be purchased at the Asian grocery stores. They come in cans. Please check out my Ebony n Ivory dessert for a picture of what the can looks like. Here is the link https://www.rotinrice.com/2010/03/ebony-n-ivory-dessert/. Almond jelly would work but the color contrast will not be as striking. Biren I love this, I love any recipe involving bean..I recently tried adzuki beans and how grown fond of them..
Oh wow, this is so cool! I wish someone gift me an ice-cream maker too. lol! Yes, I can imagine how easy it is if there’s a machine at home. I’ll have to say. This is absolutely a killer! Yummm… Thanks for sharing. Have a great weekend. Spring IS in the air – this is more unusual sundae, but one I’d like to try! I must admit, this is a new one for me but it looks amazing! Now i’m going to have to go and buy an ice cream maker! AIS KACANG????!!!! The last time I had some I was in JB…goodnes…this is why I LOVE visitng you because you always take me back to a lovely memory…awesome and I wish I could spoon the screen with these hot temps here today 🙂 AWESOME BIREN!! Let the record show that I LOVE DURIAN!!!!!! Although my picture should speak for itself. Teehee. This is one of the best types of desserts that I’ve had. I like your substitution of ice cream much better than shaved ice. This looks absolutely delicious, Biren! Hope you have a lovely weekend. LeQuan, there is nothing wrong with loving durian. It is definitely an acquired taste but many people do like it. Some of the cakes and desserts when done well can be quite nice. This ice cream is definitely creamier than the shaved ice and best of all, it can be kept in the freezer for whenever I feel like having some. 🙂 Have a good weekend! Spring for us is back in the 80s here in Florida. We’ve had a picture perfect weather week! The only problem is…everyone is down here for spring break! Your ice cream dessert is so interesting to me. I have had adzuki beans in shave ice when I lived in Hawaii, and I’ve even made red bean paste to use in a dessert. I tried durian candy, and liked it, but had to get used to the smell, and would love to try the fruit. I have made some pandan pancake puffs (love pandan). I have used palm sugar and enjoy it. I was never a fan of creamed corn, and I haven’t tried grass jelly. I would love to try your ice cream! It is fascinating. I want to make my own ginger ice cream, that’s on my list. Do you have a good recipe for that? Thanks so much for this recipe! Wow Lyndsey…sounds like you have experienced and enjoyed a lot of tropical goodies. Durian can be nice but it is definitely an acquired taste. Pandan is simply wonderful. I made a pandan cream pie based on the key lime pie recipe that was really good. Check out this link https://www.rotinrice.com/2010/05/guest-post-pandan-cream-pie-and-rotis-100th-post/. 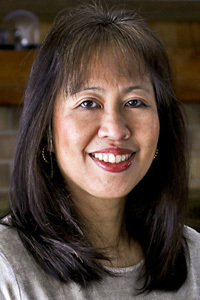 It will take you to another blog as it is a guest post I did for Denise. 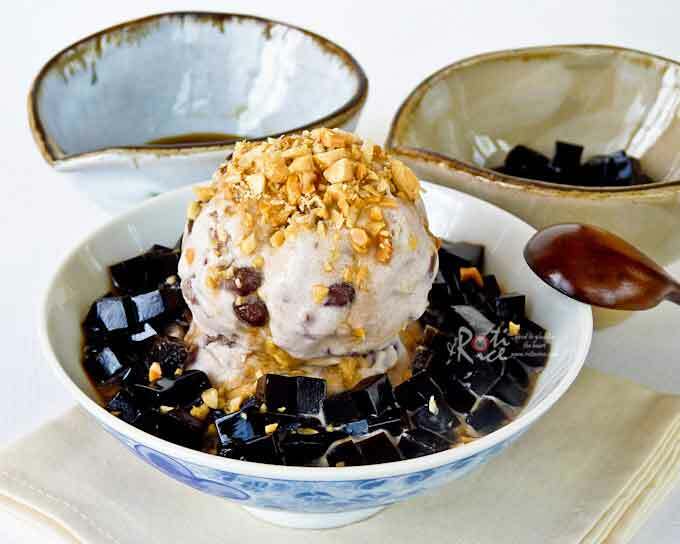 For the grass jelly, try this link https://www.rotinrice.com/2010/03/ebony-n-ivory-dessert/. This dessert is great with palm sugar syrup but maple syrup works just as well. I think you will enjoy it. That would be great! Thanks for the links. I am SO ready for ice cream sundae season to begin, especially after seeing this! Delicious. How new and different! This sundae looks great! I love all of the interesting flavors! Oh yes, I remember those attap chi. I’ve seen those in cans at the Asian grocery stores. They are a nice addition to ais kacang. Red bean ice cream is one of my favorites. The addition of cream corn topped with leong fun really does satisfy the craving for ice kacang. Oh la la!!! Love your version of ice kacang! that looks sooooo yummy! is there any way i can do this without an icecream maker ): ?